How would you like a college class that allows you to learn at midnight, gives open book tests, and doesn’t require you to sit through the teacher’s lectures? Would it be a dream come true? Welcome to the world of distance learning. Thanks to recent advances in technology, achieving a college degree has never been easier. Many stay at home parents, working professionals, and even busy college and high school students are taking advantage of the convenience that online college courses offer. Distance learning is growing rapidly, and opportunities to earn college credit are becoming plentiful as colleges and universities expand their online programs. Although all of the recent progress in the availability of online education is cause for excitement, prospective students should be aware of a few cautions before settling into an online program. An Internet based course is very different from a typical classroom course. Online learning, although flexible and convenient, can often require more effort and time than a traditional college class. Some students thrive in the online environment while others find it extremely difficult. People who wish to learn online must be self-motivated individuals. Because there is not a specifically scheduled class time for most online classes, it can be easy to lose track of one’s involvement in the class or miss scheduled assignments. Online classes are not self-paced. Although students may complete the coursework at their own convenience, they must also keep pace with rest of the class to study certain course components and meet assignment deadlines. One thing many people may not realize is that distance learning requires a large time commitment. Because online students are not able to converse in the classroom, most online classes require a lot of dialogue through Internet postings on a class message board. Students are usually graded for these discussions, and additional research and citation are often required for quality conversation postings. Online conversations allow teachers to give a participation grade, and are normally very important for students to actively maintain throughout the duration of the course. Staying on top of what is happening in these daily online discussions can be quite time consuming, depending on the class and instructor’s requirements. Another important thing any prospective student should know about online learning is the large amount of reading involved. Normal college classes usually require a heavy reading load, but Internet based classes will typically require even more. Due to the lack of a physical classroom setting, most online teachers prepare written lectures for their students to read instead. Prospective online students should consider themselves college level readers before beginning an online course. Additionally, online students must have good reading comprehension, because they will need to retain all the textbook information without the help of a traditional audible lecture. Some classes may provide video lectures to help students in this area of learning, but many do not. In addition to well-developed reading skills, it’s important that online students be able to express themselves accurately through writing. Unless the class involves some type of real-time, interactive distance learning through video, most online learning relies heavily on expression through written words. Internet slang and abbreviations are not allowed, and some students find it difficult to properly convey their tone of voice and meaning through writing. Because this is such a big part of Internet learning, students should feel comfortable with explaining their thoughts through writing before registering for an online class. Good writing skills may also be necessary for passing exams. Testing in an online class will vary from teacher to teacher, but tests may sometimes be very difficult because they are open book exams. Instructors may often require more essays and give fewer tests and quizzes to evaluate the amount of learning that is taking place. Teachers may also provide questions that are not easily found in a book and must be considered logically based on learned information from the class. Some students who are used to studying for traditional tests may find these changes difficult. 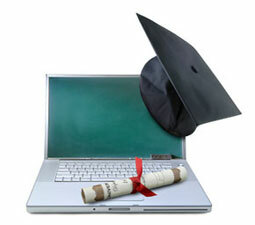 Finally, in order to achieve the best possible results with online learning, a student will need a reliable computer. Anyone who wishes to take a class online must make sure that his or her computer meets the specified criteria outlined by the school. Old or slow computers may not work well for this type of learning. Because online classes require such a large time commitment, it is probably not wise for students to take a distance learning class unless they have access to a computer at home. An overall familiarity with computers is also necessary for success in an online course. Before registering for a distance learning class, students should be comfortable using email, word processors, and the Internet in general. Online learning is indeed a great benefit for many people who can take advantage of the flexibility that this type of course work provides. Even so, awareness of the skill and commitment that distance learning requires is extremely important for anyone considering online courses. Knowing this information will allow you to make the most suitable choices in order to reach your personal goals in the area of education.